K.C. 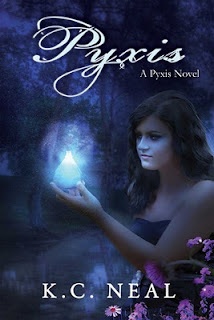 Neal is interviewed here today as part of her blog tour to promote her new novel Pyxis. If you haven't already, please check out my review of the book. So here we go! Thank you for doing this, K.C.! I loved Pyxis. Thanks so much for having me on the blog! I’m so glad to hear you enjoyed it. It’s got a pretty unique concept! Please tell us a bit about this paranormal world. How did your ideas form as you began to create it? I knew I wasn’t going to write a paranormal book with any of the usual creatures. And that wasn’t because I was trying to be different; I really didn’t think I was clever enough to put a new twist on vampires or werewolves or fairies. I’m not really sure where the idea for Pyxis came from, but the first seed of the story was the pyxis box with the bottles full of mysterious colored liquids that influenced people’s emotions. I thought the story would center around the potions, but it grew into something much larger. Are any of the characters or places inspired by those you know in real life? Tapestry was inspired by McCall, Idaho, a tiny mountain town on a lake where I spent many, many summer days. It’s a really important place in my own personal history, and even though I didn’t grow up in a town like Tapestry, I always wondered what it might be like. For the most part, the characters are amalgams of many different people and my own imaginings. Angeline was named after author Angeline Kace, who is a good friend of mine. They share some qualities, such as deep loyalty to their friends and great enthusiasm. Mason isn’t based on anyone specific, but he’s the kind of guy I wanted to have around when I was Corinne’s age. Sophie, who played a fairly small part in Pyxis but who you’ll see a lot more of in Alight (Pyxis Series Book 2), is kind of a blend of three different people I know who are charismatic and fun, but also outspoken to the point that they often offend people. Did it take long to get the book drafted and edited? I wrote the first draft of the book in 35 days. It might sound great to write a book that quickly, but looking back I wish I’d taken more time. It had a lot of problems, and I ended up dropping entire characters and subplots, and adding new ones. During a major revision that took about three months, I rewrote probably 80% of the book. At times it felt like it was going painfully slowly, but looking back now I realize the whole process went extremely quickly by most standards: from initial idea to publication, it was almost exactly 10 months. The cover is gorgeous! It really has the ability to encourage readers. Who designed it? Thank you, I really love it, too. The photographer is Tiffany Mize-Carter, and the girl in the picture is actually her daughter, which I think is really cool. The artist is Claudia at Phatpuppy Art, who is incredibly talented. 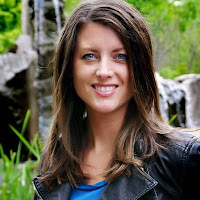 She’s created some of the most stunning YA covers out there, in my opinion, and I feel very fortunate to be working with her. I can’t wait to see what she does for the next two books. I know I set up a lot of questions and mysteries in Pyxis, and almost all of them will be partially or fully addressed in Alight. For example, very early in the next book you’ll find out exactly how the pyxis liquids work and what they’re for. You’ll also find out who the other Guardian is, and let’s just say it’s going to make Corinne’s life difficult. Corinne also becomes involved in a bit of a love triangle, as a new love interest is introduced. One thing that will have a profound effect on Corinne is that she’ll find out she’s not the only Pyxis in the world. It will make things easier for her in one sense--it’s always better when you know you’re not alone--but also more difficult in the sense that she’ll realize her pyramidal union is extremely inferior in terms of abilities and how tightly bonded they are. And she’ll come to understand that these weaknesses would easily get someone hurt or killed. In Alight, Corinne must bear some very heavy burdens, which will test her in many different ways. I am very excited about writing this book; it’s going to be full of revelations and confrontations! Are there any other writing projects outside of the Pyxis series that you’re currently working on? I’ve started writing an adult series under a pen name, but I’ll be putting that aside for a while so I can focus on writing Alight. I’m also working on a novella-length book of bonus material to accompany Pyxis. It will have the prologue to Pyxis, so you can see what happened between Mason and Corinne before Mason left for Africa. It also will include Corinne’s journal as well as something from Mason’s point of view. Are there any words of wisdom you’d like to pass on to budding authors out there? One, find a skilled, more experienced writer to critique your work, and don’t fear criticism; a good critique will help your writing improve by leaps and bounds. Two, an idea for a story isn’t the same as a plot; a book needs a plot and a plot needs tension and conflict, not just cool ideas. Three, read voraciously; aside from actually writing, reading is your best training. Lastly, is there anything else you'd like to mention? I love to connect with people online, and in particular through Twitter. Please follow me (@KCNealTweets) and tweet at me! To celebrate the launch of Pyxis, I’m doing a Kindle giveaway through the first week of December, so please go to my blog and enter the giveaway and spread the word. And last, of course I hope you will check out Pyxis - it’s only $2.99 on Amazon and Barnes & Noble. Thanks again for hosting me, Sophie!